(1971) Kirk Douglas, Marlene Jobert, Trevor Howard, Tom Courtenay. Some nice European location shooting in this Cold War spoof. 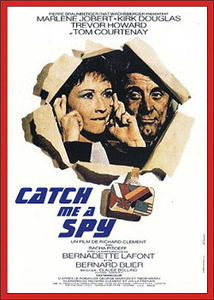 Jobert plays a French woman trying to obtain the release of her hubby, who’s been arrested for espionage. Douglas is the mysterious Romanian who keeps popping in and out of the picture. Trevor is good as the Parliament member who can’t quite figure out what’s going on in this amusing intrigue-fest. Nice color, 16mm.